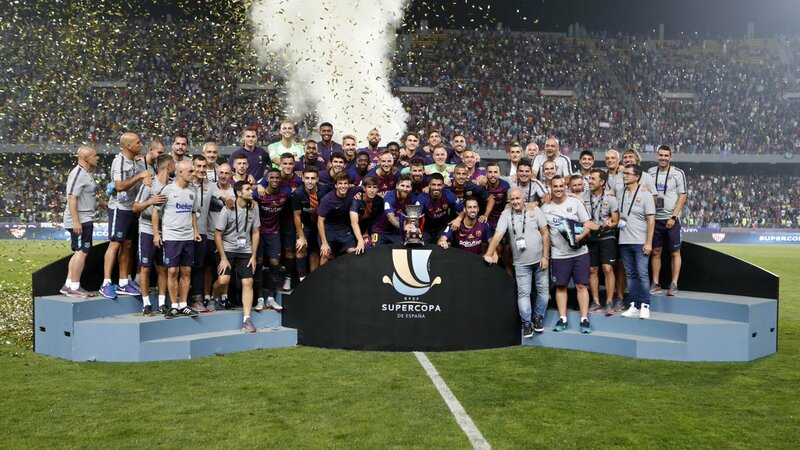 Barcelona players after winning the 2018 Spanish Super cup match against Sevilla. Marc-Andre ter Stegen saved a last-minute penalty to guarantee Barcelona a 2-1 victory over Sevilla as the La Liga champions won the Spanish Super Cup in Tangier, Morocco. Pablo Sarabia gave Sevilla the lead when the video assistant referee (VAR) gave a goal which has been ruled out for offside. But Gerard Pigue equalized with a tap-in after Lionel Messi's freekick ricocheted off the goal post and Ousmane Dembele scored a screamer to give Barca the lead. Ter Stegen fouled Alex Vidal in the box to gift Sevilla a penalty but Wissam Ben Yedder's poor spot-kick was easy for the German goalkeeper to catch. Barcelona have now won the Spanish super cup six times in the last nine years.